Parts of California's wine region are being ravaged by fast-spreading fires that have killed at least 11 people. About 20,000 people fled from Napa, Sonoma and Yuba counties in response to some the state's worst-ever wildfires. 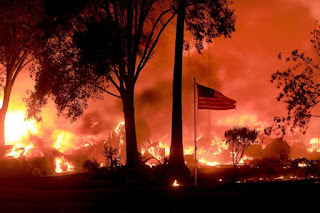 "These fires have destroyed structures and continue to threaten thousands of homes, necessitating the evacuation of thousands of residents," Governor Jerry Brown said, declaring the emergency.